Grackles have strong jaw muscles able to crack open chestnuts, beechnuts and acorns in the bill. They are also known to saw acorns and dried corn into smaller pieces using the sharp keel of a horny plate on the bill. Red-winged Blackbirds are one of the most polygamous of all bird species. They have been observed to have as many as 15 females nesting in the territory of a single male. On average, a single male has roughly five females in its territory. A century ago, Great-tailed Grackle territory was just inside Texas. They have spread north and west since then quite successfully. Boat-tailed Grackles often nest over water to keep predators at bay and the fledglings can swim a few meters using wing flapping, if they fall out of the nest. Cowbirds should be named the “Bison Bird” for their pre-settlement role in following the constantly moving herds of bison on the Great Plains while feeding on the insects that they dislodged from the vegetation. To glean insects and invertebrates, you can watch starlings poking their beaks into the ground, opening wide to spread the leaf litter and soil (known as gaping) and then picking out exposed larvae and earthworms. How Do You Attract Blackbirds? *Contact your local Wild Birds Unlimited Store for product availability. Some products are species specific and not carried at all stores. No shells. No mess. 100% edible. Our No-Mess Blend is great near flower beds, patios and decks. 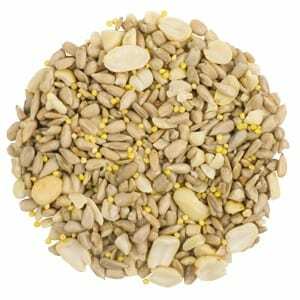 Our unique No-Mess Blend bird seed features seeds that have had their shells removed so only the meat of the seed is left. No hulls on the seeds makes for tidier feeding, since there’s no debris on the ground to clean up. Pound for pound, our No-Mess Blend bird seed offers the best value because you do not pay for uneaten seed waste. The birds eat everything. Our No-Mess Blend’s mix of sunflower chips, hulled white millet and shelled peanuts appeals to birds that eat at the feeder or on the ground. *Contact your local Wild Birds Unlimited Store for product availability. Some products are species specific and not carried at all stores. Imagine a wood-free bird feeder that actually looks like wood! Our EcoTough® Classic won’t crack, fade or rot and has a lifetime guarantee. The Classic has curved ends so you can see birds feeding on both sides at the same time. Perch drains allow seed to drop out of the feeder for ground-feeding birds to eat, and angled perches let empty seed hulls be blown away by the wind. The removable screen bottom is treated with EcoClean® Antimicrobial Product Protection, providing 24/7 product protection. The EcoTough Classic Feeder can be hung, but it does not come with the hanging wire to do so. 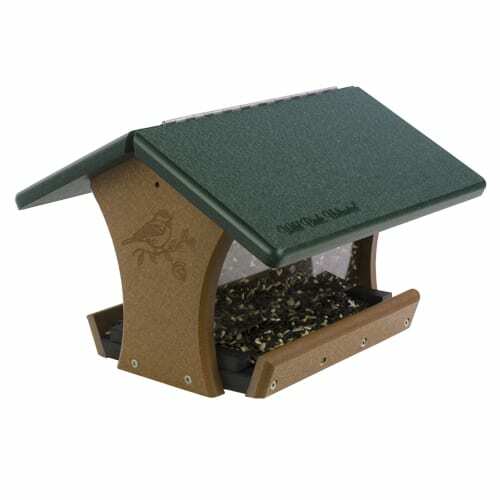 We recommend that this feeder be pole mounted due to its weight (7 lbs unfilled) and size. If a tree were to hold this feeder, it would have to be a very sturdy tree. 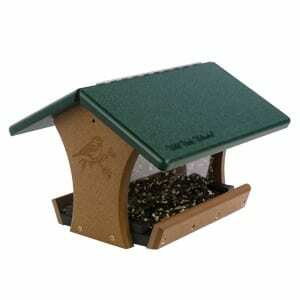 Tray Feeders allow birds to easily locate seed. 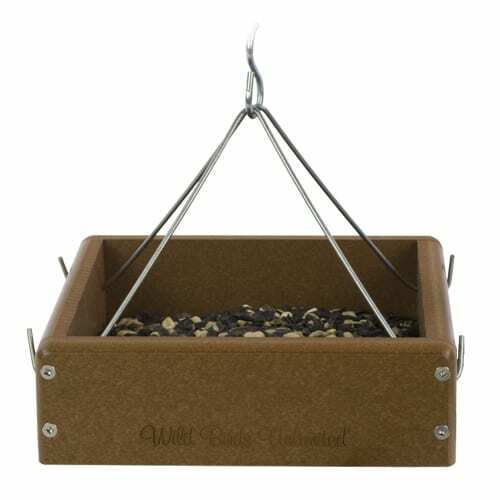 Try placing the versatile EcoTough® Tray Feeder in your favorite viewing area and attract a diverse group of birds by offering different types of bird seed, peanuts, suet snacks or fruit. Blackbirds are more migratory in the northern ranges and non-migratory, year-round residents in the southern ranges. What Foods Do Blackbirds Eat? Blackbirds nest in trees, bushes and marshes. Will not use a nest box. Starlings nests in existing cavities. Will use a nest box. What Do Blackbirds Look Like? Male and female have similar plumage except female Red-winged Blackbird and Brown-headed Cowbird are paler. No seasonal plumage changes except for Starling. Juvenile plumage similar to adults. Maps provided by Birds of North America Online. Maintained by the Cornell Lab of Ornithology.